Cosgrove is the drummer for Alien Ant Farm. He's a gear head and musician in the boldest sense of the term, forever searching for and improving upon his technique and musical prowess. 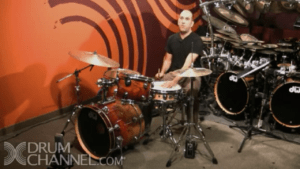 In his formative years he took lessons from a private teacher and now he's currently taking lessons (in between touring and promotion) from DW Drums President Don Lombardi, focusing on accent and time signatures while learning to tie all of them together.